The serial number is 962361 which I believe dates it to the early 1960's, probably 1962. The lens reads Kodak Ektar f:4.5 152mm ES 3097. The shutter fires. The bellows look good and flexible. The outside covering has wear as does inside faceplate - see pictures. Because of that I had to list it not working. I got it this way. As you can see the back cover is not attached. The lens is marked Graflex Optar 135mm. I only have what's pictured. Speed Graphic 2 1/4" x 3 1/4" with Graphlex Optar f/4.5 101mm Lens, Roll Film Film Holders. Graflex Optar Lens: 101mm, f4,5 Minimum aperture. IMPORTANT NOTE: The Viewfinder is missing its eyepiece. Camera is listed as untested . Acquired from original owner estate. It looks to be in great condition -that it was put away in a professional road case upon the owner’s retirement. Camera is clean with typical usage wear. Bellows look to be in good condition . See pics for condition as well and I’m happy to answer any questions you may have prior to bidding . Graflex Pacemaker?. Speed Graphic 2x3, Wollensak 101mm f4.5, film holders Seems to be in good condition shutter works. IT HAS A GRAFTAR 85mm f3.5 LENS. Vintage Speed Graphic Large Format Camera Serial #4623 Complete with case. 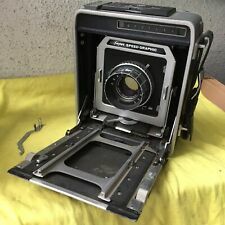 Vintage Speed Graphex Large Format Camera Serial #4623 Complete with case.. This Speed Graflex system comes with a Model 2 Film Pack Adapter, in addition to three other film plates. I believe its a 2 1/2 by 3 1/4 format. 101 mm lense with 4.5 speed. The camera has been stored in its case with the flash accessories and plates. Serial no. 915930. Rangefinder has been stripped off. Normal wear on the leatherette. Bellows are light-tight, internals are in good shape, glass is clear, shutter works properly. Sold as is. I am unsure if the unit works. See photos for condition. Please ask any questions prior to purchasing or any special requests. Shipping to United States only. Payment via PayPal only within 48 hours. Thank you! I don't see any breaks in the bellows. I have pulled it out as far as I can. Leather handle in good condition. Graflex crown graphic Camera/Vulcanoid Case. The package comes with bulbs and other items scene in the case. Please contact with any questions. Used graflex crown graphic camera. Original case and original accessories included. The one and only problem with this one is that the front black Supermatic shutter will need a service for use. This is a great opportunity to buy a real piece of WWII history as there's not too many of these around anymore. Also included is the wrist strap. Everything is in good clean condition. Estate find and NOT film tested although everything moves freely and the shutter reacts well. Also, there are 8 Film Holders, as pictured. The optics seem to be clean and clear, and the rest of the outfit seems to be intact. It was not tested. It appears that possible there is a small bend in the rails but it does not hinder focusing at all, the entire assembly moves very freely when unlocked and while using the focusing knobs. Shutter fires well on all speeds. Lens: Graflex Optar f4.7- 135 mm clean with no scratches. Shutter sticks and is inaccurate, but all else functions well. The viewfinder is clean/clear. The focusing moves well and smoothly. The bellows have no holes but are a bit stiff. The rangefinder works well. The rear focal plane shutter works but not well. At the highest tension it will fire fairly well at each speed. Format: 4X5 Film. W/SIDE RANGE FINDER; W/SPRING BACK. More than average wear for the age of the item, and may have dents, dings or finish loss. Glass may have marks or blemishes, but should not affect picture quality. The serial number is 513450. The instruction manual is also included. Here we have a Graflex Century Graphic #504545. Black "mahogonite" body with black bellows. Lens is a coated 103mm F4.5 Trioptar lens in a Graflex Century shutter. Set includes original ground glass back, three wood 2 1/4 x 3 1/4" Graflex Type 5 film holders and a Graphic 23 roll film holder. Graflex Century Graphic "Baby" Graphic. However, my opinion and yours may vary since everyone judges differently. I am only human and do make mistakes. They may have slight defects, show wear, have discolored lining, small stains, odors etc. but I will try and list what I see to the best of my ability. All pictures show the actual item. Manufactured between 1938 and 1947 by Graflex, Inc. Like it’s bigger cousins but taking 2-1/4x3-1/4 images—a Speed Graphic in convenient travel size! All Speed Graphics have focal-plane shutters in the back. We cannot fix situations we are unaware of. We appreciate your patience and opportunity to correct a situation if that happens. LOC: box 3. You are buying from a professional photographic dealer. We try and list all pertinent faults. Vintage Camera Graflex Century Graphic Black Bellows with Many Extras -NICE! Graflex Century Graphic Black Bellows with Many Extras. Graflex Century Graphic. Black Bellows with Many Extras. Originally top handle, looks like a factory change to the side. Tapered bellows. Rising front. Folding optical finder with cross hairs. Single focus knob on wooden bed. Body # 148xxx. 135mm f/4.5 Anastigmat lens. In needs cleaning and bellows repaired condition. fires and with a little effort it could present as a very nice collectible. We cannot fix situations we are unaware of. We appreciate your patience and opportunity to correct a situation if that happens. The body appears to be in great shape for its age. The Lens is a Compur F. Deckel-Munchen, Carl Zeiss Jena F4.5 13.5cm. We are unsure if it works, to be sold as is. It is stamped Genuine Cowhide'. WE ARE THE ONLY ONES THAT CAN RESOLVE THE ISSUE. It is also possible to combine invoices. ALL INTERNATIONAL SALES ARE FINAL. The filters pictured are included with a 49mm to series 8 filter holder to which the lens hood attaches and retains the series 8 filters. The body is in used good condition. The shutter works and speeds 1/25 and faster sound good, slower speeds stick. The rangefinder works but is a little cloudy inside. More than just a pretty picture. I describe with best knowledge and I try to be as accurate as possible. if you have. THE LENS IS A GRAFLEX OPTAR F/4.7 135MM, THE GLASS LOOKS CLEAR AND I DO NOT SEE ANY SIGNS OF FUNGUS. The lens filter ring shows a minor convulsion, in good working Order. You are purchasing EXACTLY what you see in the pictures! It is mounted on a Graphic Kodak Flash Supermatic f4.5 shutter with speeds from 1 second to 1/400th of a second plus T & B. The bellows are soft & supple with no light leaks. The Carl Zeiss Jena Tessar lens is in really good shape with no visible scratches or imperfections. The glass is clear and clean with no haze or fungus. The serial number on the lens is 21194213. The fine gentleman who owned this amazing collection had been a professional photographer and avid lifelong collector.